H. Rick Bamman - hbamman@shawmedia.com Marian Central's Jared Churak returns the opening kick-off against Hillcrest Friday, Nov. 4, 2016 in a Class 5A playoff game in Woodstock. H. Rick Bamman - hbamman@shawmedia.com Marian Central's Ben Keller brings down Hillcrest's Dakari Smith in the second quarter Friday, Nov. 4, 2016. 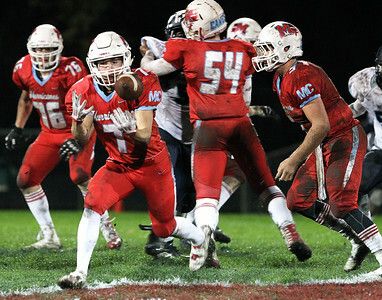 Marian Central defeated Hillcrest, 30-14 in a Class 5A playoff game in Woodstock. 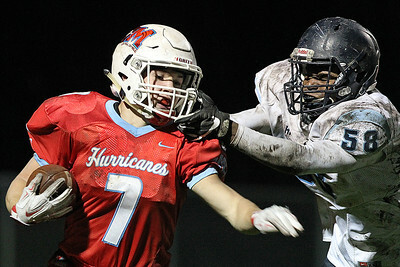 H. Rick Bamman - hbamman@shawmedia.com Hillcrest's Camron Mattox grabs the face mask of Marian Central's Brian Niemaszek in the third quarter Friday, Nov. 4, 2016 in a Class 5A playoff game in Woodstock. 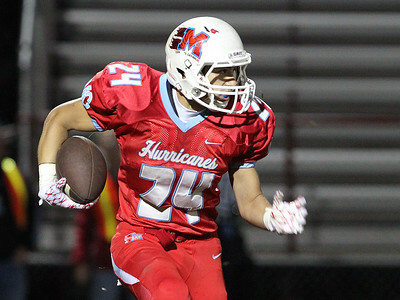 Niemaszek made a first down and had 20 carries for 205 yards in the Hurricanes 30-14 win. H. Rick Bamman - hbamman@shawmedia.com Marian Central's Brian Niemaszek bobbles the pitch from quarterback Gavin Scott (right) on the reverse in the second quarter Friday, Nov. 4, 2016. 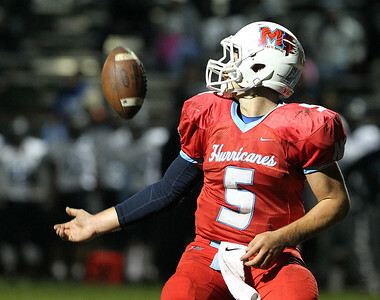 Marian Central defeated Hillcrest 30-14 in a Class 5A playoff game in Woodstock. H. Rick Bamman - hbamman@shawmedia.com Marian Central poms perform at halftime Friday, Nov. 4, 2016 at theClass 5A playoff game in Woodstock. H. Rick Bamman - hbamman@shawmedia.com Marian Central's Jake Potthoff (left) and Patsy Ricciardi celebrate his fourth quarter touchdown Friday, Nov. 4, 2016 in a Class 5A playoff game in Woodstock. 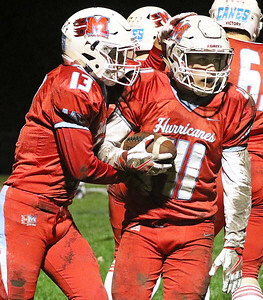 Marian Central defeated Hillcrest, 30-14. H. Rick Bamman - hbamman@shawmedia.com Marian Central's quarterback Gavin Scott bobbles the snap in the first quarter.The fumble is recovered by Hillcrest. Marian Central went on to win, 30-14 Friday, Nov. 4, 2016 in a Class 5A playoff game in Woodstock. 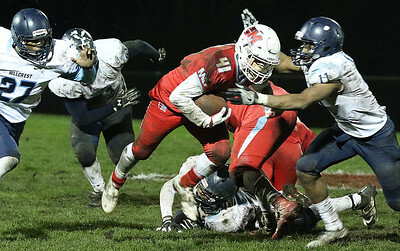 H. Rick Bamman - hbamman@shawmedia.com Marian Central's Anthony Silva runs over two Hillcrest defenders for a first down in the fourth Friday, Nov. 4, 2016 in a Class 5A playoff game in Woodstock. Marian Central won, 30-14. 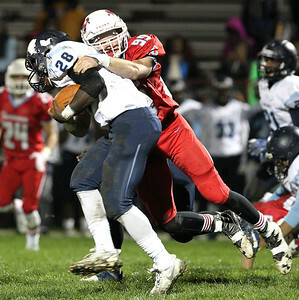 H. Rick Bamman - hbamman@shawmedia.com Marian Central freshman Patsy Ricciardi runs for a first down in the third quarter before being stopped by Hillcrest's Timmy Tyms. 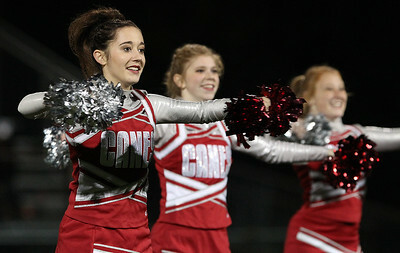 Marian Central defeated Hillcrest 30-14 in the Class 5A playoff game in Woodstock.